Patrick Watson, son of a Dundee merchant, was a successful draper and silk mercer, with premises on the High Street in Dundee. He spent his retirement living in Clifton on the outskirts of Bristol. 12-09-1809 He was baptised in the name of Peter, named after his father's brother. Liberal - A member of the committee for the return of Sir John Ogilvy as MP for Dundee. Subscriber 100 – John Henderson – a named trustee and executor for Patrick Watson’s estate. Subscriber 136 – James Lowson – a named trustee and executor for Patrick Watson’s estate. Patrick Watson succeeded to the drapery business established in 1790 by his father, James Watson, and carried it on with great success. There are references in the early Dundee directories to James Watson, draper, with premises in the High Street. It would appear from the entries in the directories that Patrick Watson worked alongside his father, effectively as partner, at least as early as 1834, the year he was married, and that he became sole owner by 1837. Advertisements of the time indicated that Patrick Watson employed sales persons and apprentices. He assumed Alexander Henderson, who had been one of his employees for 14 years, as a partner in 1860. The co-partnery of 'Watson & Henderson' was dissolved in 1868, on Patrick Watson's retirement. Patrick Watson was born to James Watson, a merchant, and Margaret Hardie in 1809. In the year he was born, his father was listed in the Dundee Directory as having been a haberdasher and clothier. His premises were stated as having been on the east side of New Inn Entry on the High Street. It would appear from Directory entries that Patrick was employed within his father’s business by the early 1830s and probably earlier, although he would not necessarily then have merited an entry. In his mid 20s, Patrick married Margaret Low, the daughter of Andrew Low, shipowner, on 1 September 1834, almost a year after the death of his mother, Margaret Hardie in 1833. Patrick’s father withdrew from the business by the later 1830s and spent his twilight years resident at 23 Tay Street. He died in 1846. Settling into married life while managing a successful business, the Watsons became parents to 6 children, although James, Euphemia and Andrew predeceased their father. It would appear from press reports and advertisements that Patrick Watson spent a great deal of time giving public lectures against the iniquities of the population at large, while extolling the virtues of living by God’s word, temperance and self respect. However, Patrick Watson’s public face as a Christian philanthropist was countered in one article which professed him, at times, to be ‘righteous overmuch’ – a damning indictment perhaps. 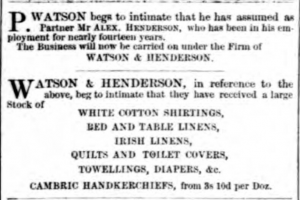 The Dundee Directories indicated that Alexander Henderson was assumed as a partner in 1860, having been employed by Patrick Watson for almost 14 years. 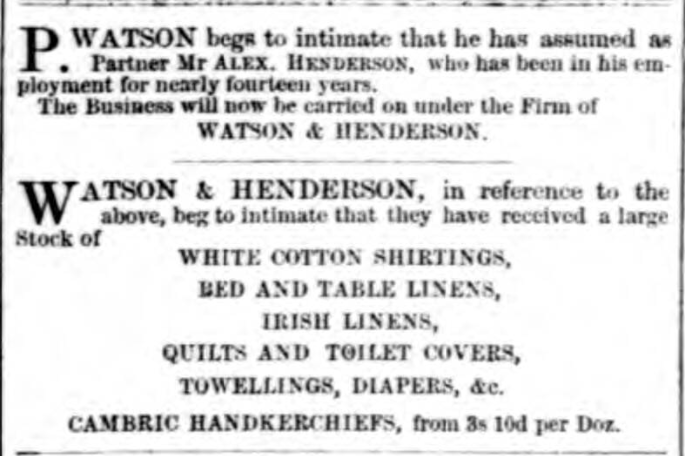 Their business was titled ‘Watson and Henderson.’ Patrick Watson ceased to have an active interest in the business by 1868, at which time it became known as ‘Henderson and Lowson,’ still with premises in the High Street. Mr and Mrs Watson were living in Howe Street, Edinburgh, at the time of the 1871 census although he retained his house at 162 Nethergate and remained on the roll of Panmure Street Chapel until leaving for Bristol in 1876. By 1881, Patrick Watson was described as being a ‘Retired Silk Mercer,’ living at Tower Leaze, Westbury on Trym, Gloucestershire. After his death, Patrick Watson’s coffin was transported by train from England to the Caledonian Railway Station in Union Street, Dundee, his place of birth. At 3 pm, the mourners congregated at the station from where they followed the hearse, drawn by 4 horses and accompanied by about a dozen mourning coaches. They proceeded by Union Street, Nethergate, High Street, Reform Street and Euclid Street to Constitution Road Cemetery. The funeral was attended by many leading and influential citizens. Old Parish Registers. Dundee. Births. (1809). 282/ 100 99. ScotlandsPeople website. Census Records. Edinburgh. (1871). 685/2 51/20. ScotlandsPeople website. Old Parish Registers. Dundee. Marriages. (1834). 282/ 220 166. ScotlandsPeople website. Dundee Directory, 1837-38. p.84. Dundee Central Library, Local Studies. Dundee Directory, 1845. p.97. Dundee Central Library, Local Studies. Dundee Directory, 1850. p.170. Dundee Central Library, Local Studies. Legal Records. Wills and Testaments. Probate of Will and Codicil. Non Scottish Court. (1886). SC70/ 6/ 31. ScotlandsPeople website. Dundee Year Book, 1886. Dundee Central Library, Local Studies. Dundee Courier. 12 June 1886. p.2. British Newspaper Archive website. Ward Chapel Congregational Church membership rolls. CH14/4/34, 35, 59. Dundee City Archives. Panmure Street Congregational Church membership roll. CH14/12/19. Dundee City Archives. Dundee, Perth & Cupar Advertiser. 20 March 1857. p.1. British Newspaper Archive website. Western Daily Press. 14 June 1886. p.3. British Newspaper Archive website. Dundee Evening Telegraph. 7 July 1886. p.2. British Newspaper Archive website. Dundee Directory, 1869-70. p.1. Dundee Central Library, Local Studies. Dundee Courier. 4 March 1868. p.1. British Newspaper Archive website. Dundee Directory, 1861-62. p.221. Dundee Central Library, Local Studies. Dundee Directory, 1829-30. p.54. Dundee Central Library, Local Studies. Dundee Directory, 1834. p52. Dundee Central Library, Local Studies. Dundee, Perth & Cupar Advertiser. 16 March 1860. p.1. British Newspaper Archive website. Dundee Directory, 1809. p.74. Dundee Central Library, Local Studies. Mitchell, Alison. (ed). Monumental Inscriptions, pre 1855. Volume 4. p.109. Scottish Genealogical Society. Dundee Directory, 1845. p.96. Dundee Central Library, Local Studies. Legal Records. Wills and Testaments. Dundee Sheriff Court. (1846). SC45/ 31/ 7. ScotlandsPeople website. Old Parish Registers. Dundee. Marriages. (1830). 282/ 220 33. ScotlandsPeople website. Dundee Courier. 19 January 1848. p.3. British Newspaper Archive website. Dundee Advertiser. 17 May 1871. p.2. British Newspaper Archive website. Census Records. Westbury on Trym. (1881). Class: RG11; Piece: 2504; Folio: 58; Page: 23; GSU roll: 1341604. Ancestry website. The information above about Patrick Watson has been collated from a range of digital and hard copy sources. To the best of our knowledge it is correct but if you are relying on any information from our website for the purpose of your own research we would advise you to follow up the sources to your own satisfaction. If you are aware of an inaccuracy in our text please do not hesitate to notify us through our Contact page.